The journey of the formation of the Leadership Academy started in 2015. The founders of Cumberland Academy became increasingly concerned that our society was not taking advantage of the tremendously formative early years before kindergarten. Most children are raised in a setting where the parent or parents are working, leaving those pre-school years spent in a day care. While many day care programs attempt to offer some academic instruction, most are not the high quality possible today. Most concerning, they are not coordinated with any particular education system which leaves the transition to kindergarten fragmented at best. As we began to search for an existing early education program which offered this sought-after continuity, we were increasingly drawn to the Montessori School and our friend Louise Dyer, the founder of Oak Hill Montessori School in Tyler. After an initial meeting, each of us realized we had an opportunity to create something special - an opportunity to offer an educational system spanning ages 2 through 18. As often occurs in collaborative efforts, original and unique ideas evolve. When we began to question what special skills a graduate of this Academy might have, leadership almost instantaneously became the obvious answer. The Montessori-trained student will have all the skills necessary to be a future leader! Choosing a name for our collaborative effort was an easy decision. The Leadership Academy will open in the Fall of 2017 and offer the parents of children in East Texas an affordable and unique alternative to the educational opportunities currently available. 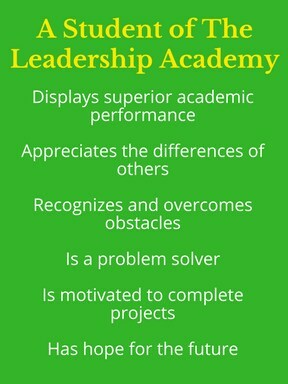 At The Leadership Academy, students, beginning at age 2, will foster leadership skills which will enable them to respond with confidence to the unique challenges and opportunities they will encounter as the leaders of the 21st century.